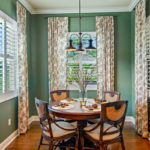 A column and arches loosely separate the family, dining and formal dining rooms in the former Minto Homes model purchased by its first owners, Paul and Christine Dekker. 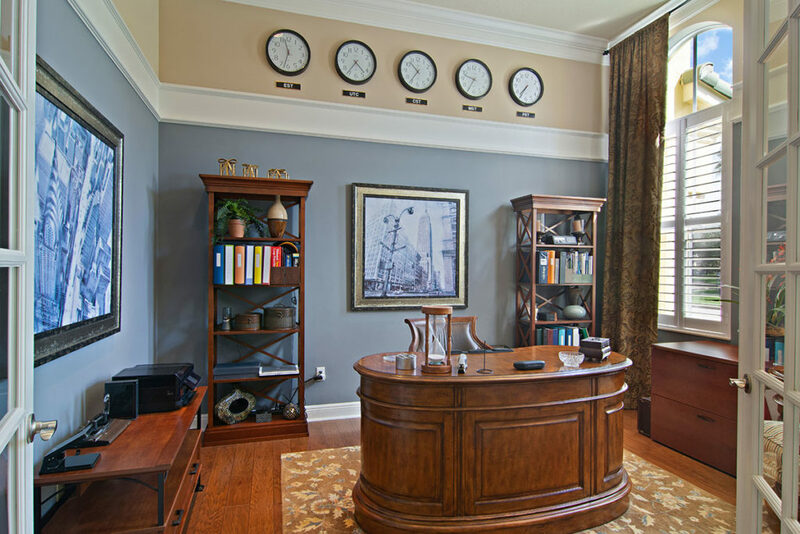 Timing and fate can be everything in real estate. 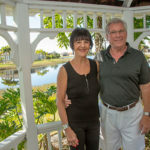 When Paul and Christine Dekker were visiting Port St. Lucie in 2009, they happened to stop by a model home in Town Park at Tradition. The on-site agent for Minto Homes happened to mention the model would be for sale the next day. This 3,653-square-foot home is one of more than a dozen in Town Park across the street from the community’s pool, clubhouse and other amenities. 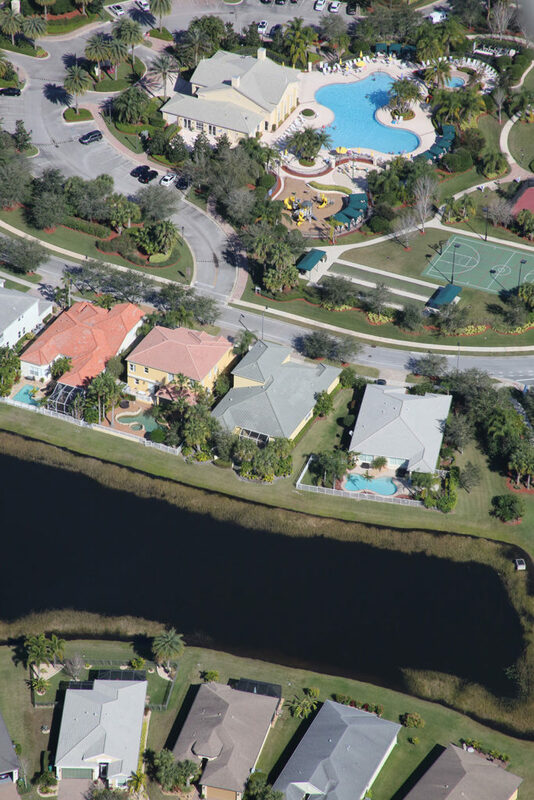 Vanderbilt Circle is a one-way street where every house faces the community pool in the center and clubhouse with facilities for tennis, pickle ball, bocce ball, horseshoes and basketball. 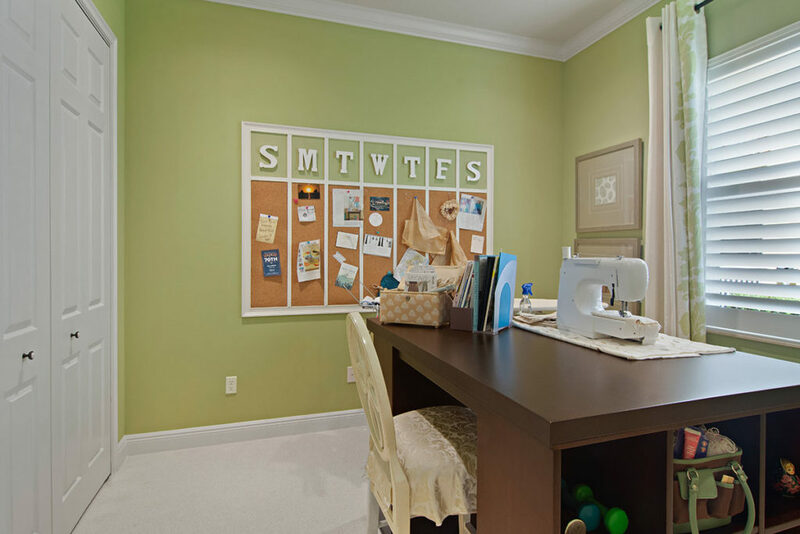 The common area includes a library, exercise room, game room and a children’s playground. 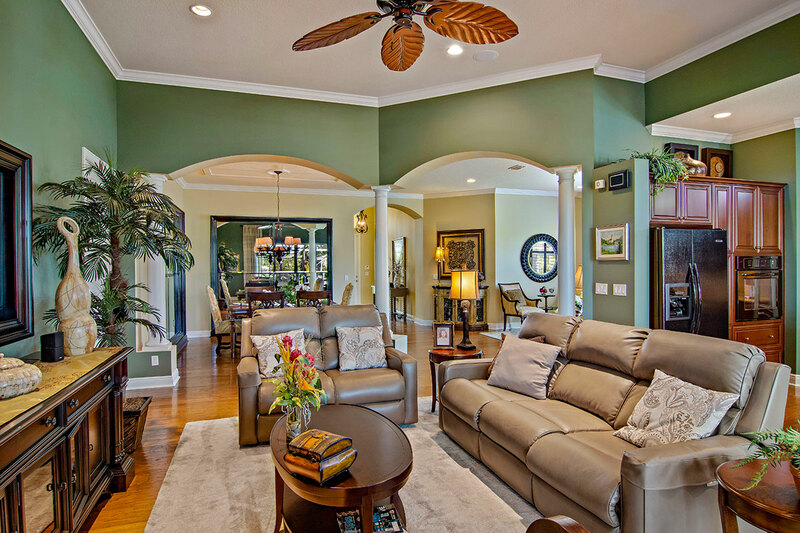 The Dekkers loved the model home’s paint scheme but wanted a different paint that would make walls easier to clean. The couple had the inside and outside painted with the same colors. 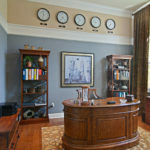 Three projects upgraded the home on model row, which already had all kinds of bells and whistles. The lanai was screened in as well as the garage door for privacy and to allow a breeze. Forty-five-degree angled walls give the formal sitting room an open, airy feel. The framed artwork and furniture came with the home purchased from Minto Homes. 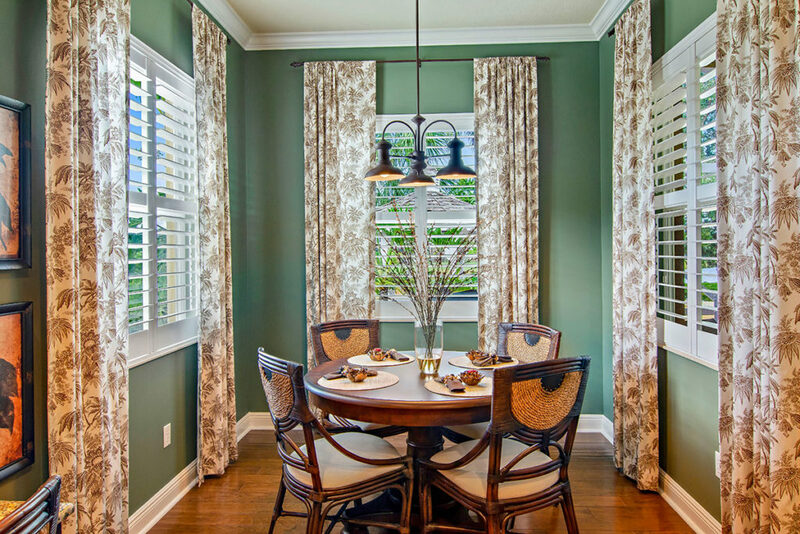 The long drapes were not really functional, so $40,000 worth of impact windows were fitted with plantation shutters “for the Florida look.” Seven ceiling fans were installed, including one on the lanai. The five bedroom, four-and-one-half bathroom home has high ceilings and crown molding in every room with multiple, recessed high hat lights. 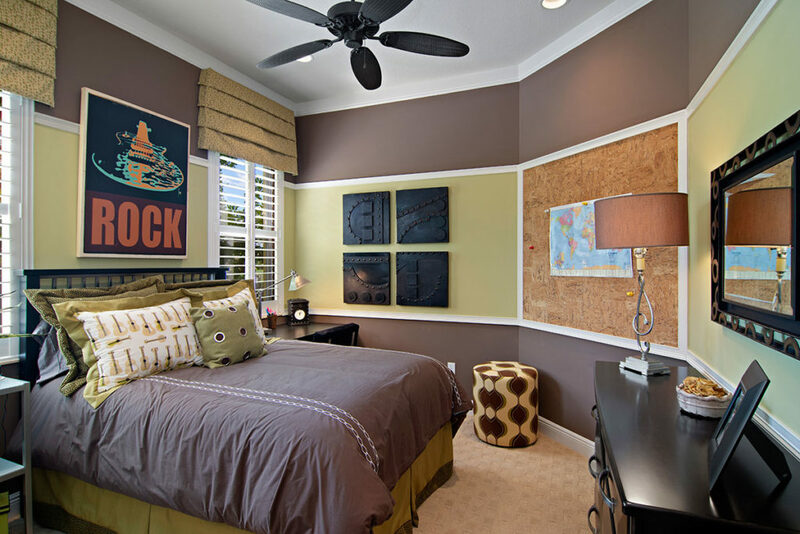 Three bedrooms have attractive headboards built into the walls. 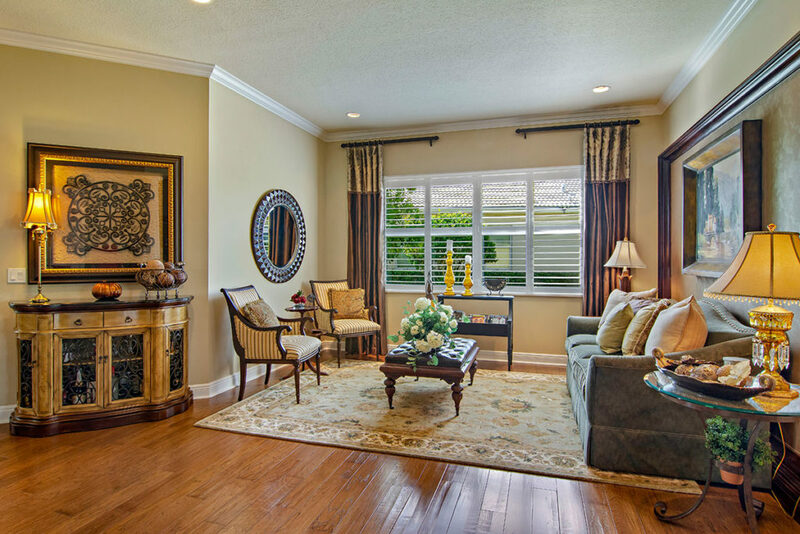 A dark wood frame in the living room nicely surrounds a large-screen TV. 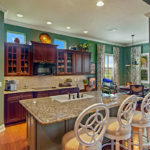 With all granite counter tops, the large kitchen with breakfast bar has an ingenious pantry design. In the corner at a 45-degree angle is what appears to be two cabinets. It is actually a door into a walk-in closet with plenty of shelves. 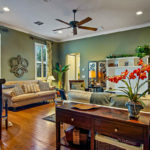 The first level is covered with $40,000 worth of hickory flooring and has a layout for entertaining in the adjacent family, sitting and dining rooms. 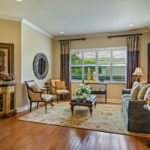 Designed for hosting house guests, there are two separate guest quarters. The “Boys” and “Girls” bedrooms share a full bath. 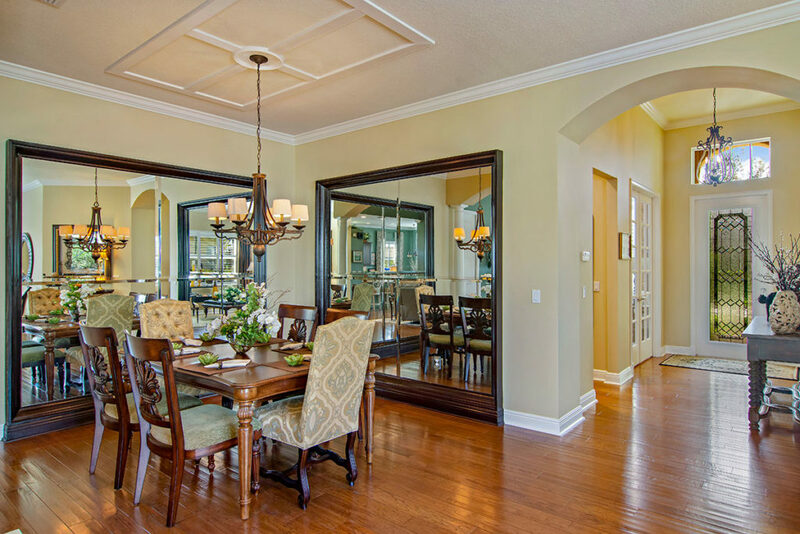 What appears to be cabinets at left is a door that opens into a large walk-in pantry. 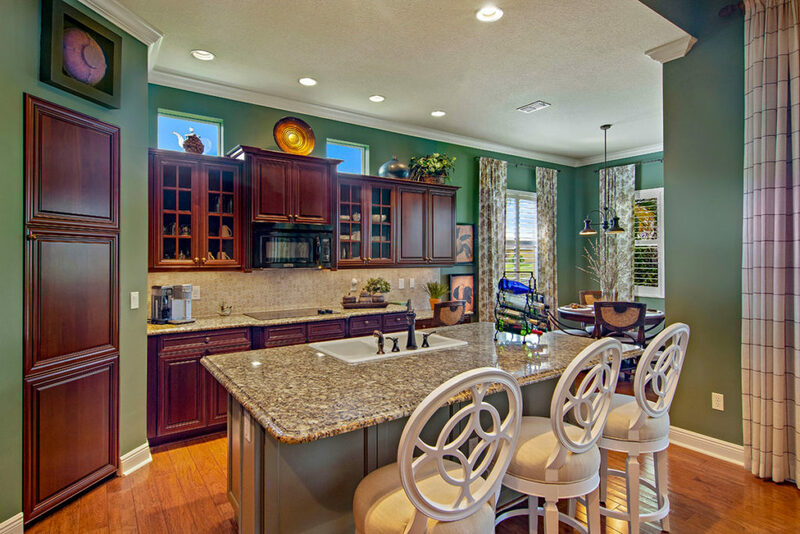 No improvements were made to the model home kitchen. In another brilliant use of space, the two-and-one-half car garage has a large storage area under the stairs to hide what shouldn’t be seen, like cans of paint. The garage will easily hold two cars and a golf cart. 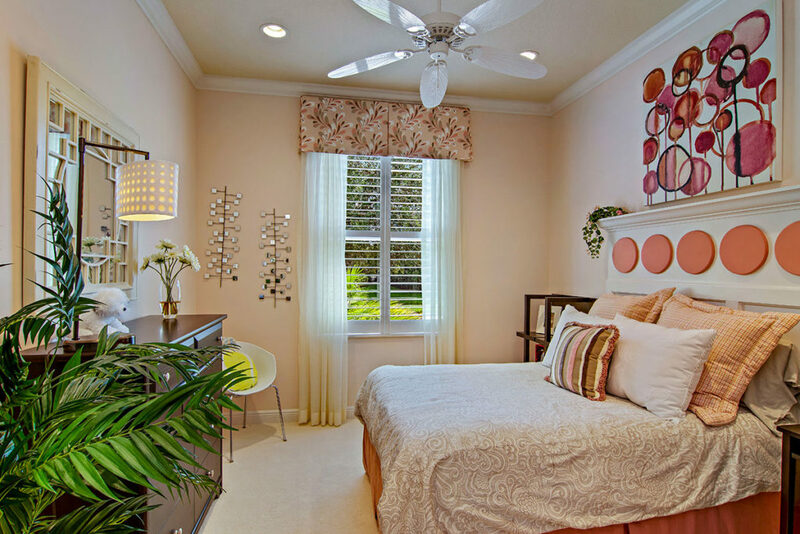 The master bedroom with lake views has two unassuming doors as you enter the room. They are at an odd angle, but one opens up to a large “Hers” closet and the other to a smaller “His” closet. 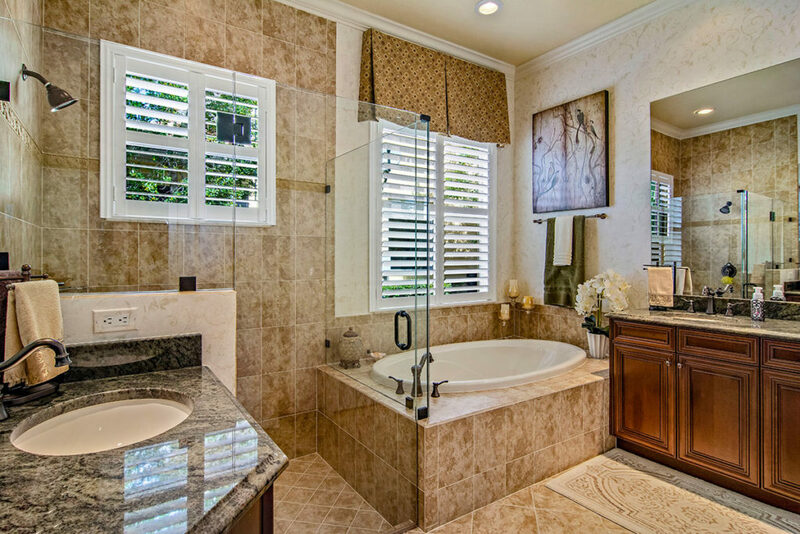 The beautiful master bath has a glass shower and a large spa tub, a builder upgrade the couple enjoy. Another add-on Paul loves is the nine-speaker sound system, which allows music to be piped in to one or all the rooms in the home. 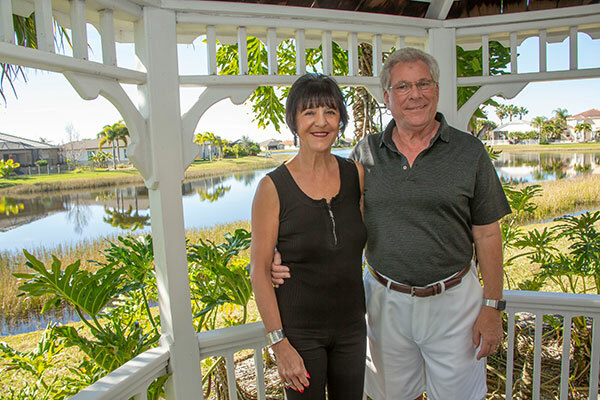 The couple also enjoy the lush landscaping, more elaborate than other residences in the community. 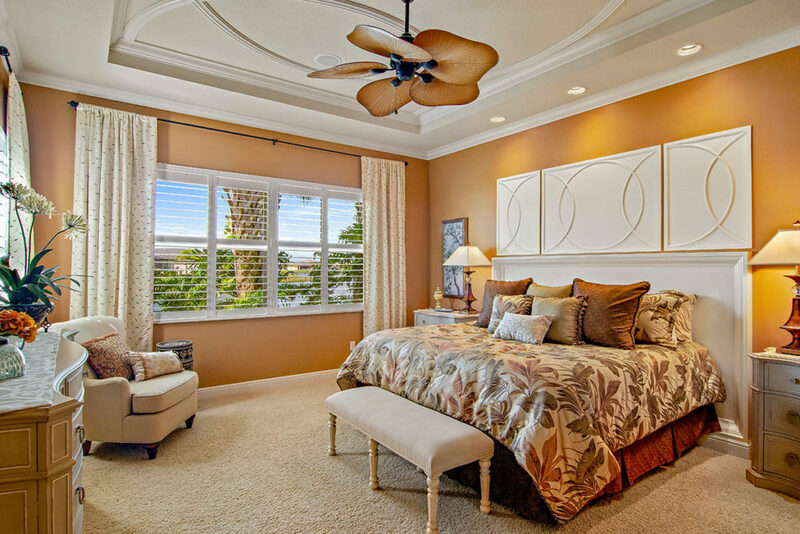 Ornate crown molding and the ceiling in the master bedroom are accented by one of seven ceiling fans installed by the Dekkers. The built-in headboard is a bonus feature. The stone patio and gazebo offer views of the lake behind the house. “I feel like I am on vacation when I sit outside and enjoy my coffee in the morning,” says Christine. 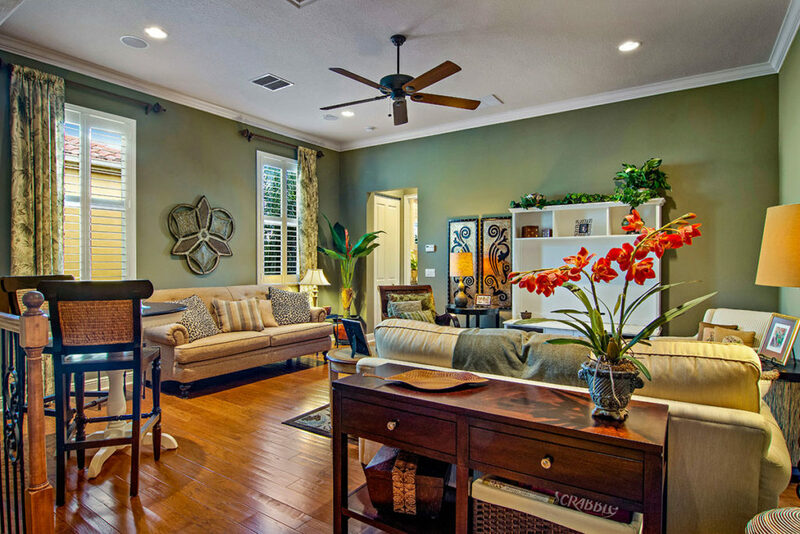 “The house has a nice flow when you walk in the front door and see right out to the lake,” says Paul. The couple has moved a few miles away to Verano and a three-bedroom home. “We no longer need five bedrooms, and if we weren’t downsizing, we would not have moved,” says Paul. 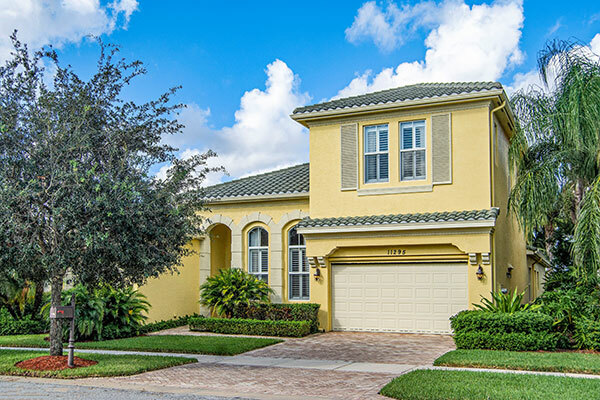 The Town Park home is listed for $510,000 by Kay Rodriguez with Lang Realty in Port St. Lucie.